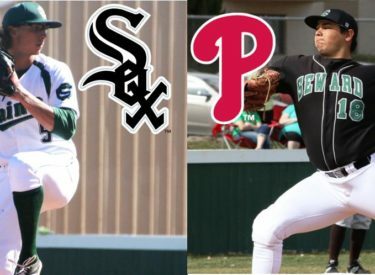 Two former Seward County standouts saw their dreams come true this week as 2015 grad JB Olson and 2016 alum Jakob Hernandez heard their names called in the 2017 Major League Baseball Draft. Olson was the first of the two former Saints picked after yet another outstanding year at the back end of the University Oklahoma bullpen. Olson went with the 12th pick of the 10th round to the Chicago White Sox on Tuesday. Olson was an All- Big 12 pick again this season for the Sooners after notching a 5-1 record with 8 saves while posting a 1.99 ERA in 45 1/3 innings pitched. In two seasons with the Saints, Olson racked up 16 wins and logged 187 innings with a sparkling 2.60 career ERA at Seward. Hernandez got the call one day later on Wednesday, going to the Philadelphia Phillies with the 8th pick of round 21. Hernandez will trade in his cap from the University of Texas-Arlington where he spent one year after Liberal for the City of Brotherly Love. In his only season with the Mavericks of UTA, Hernandez was spectacular, going 6-1 with a 3.28 ERA while collecting 89 strikeouts in 79 2/3 innings worked to earn 2nd Team All-Sun Belt honors. Before his move to the Big D, Hernandez put together one of the best seasons on the mound in Seward history, winning 10 ballgames and striking out 159 batters to lead the country in 2016 in route to an All-American nod from the NJCAA. Olson and Hernandez join a long list of former Saints to be given a chance from a Major League organization and hope to become Seward alums numbers two and three to reach the big leagues, following in the footsteps of the Kelby Tomlinson who remains the only Saint to be given the call so far.